The so-called Alexander Sarcophagus of Istanbul Archaeological Museum is regarded as one of the most important archaeological discoveries of the nineteenth century. It was found in 1887 in the underground royal necropolis of Sidon (present day Saida). Originally it was painted. The sarcophagus belonged to the King of Sidon Abdalonymos. 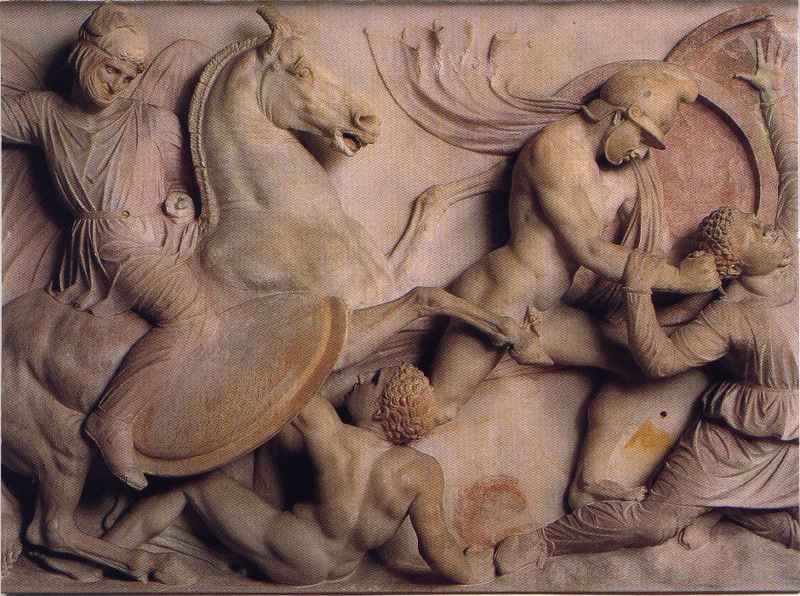 One of the long sides of its casket shows a battle scene between the Scythians (Sakas) in the Persian service and the Greeks, i.e. Macedonians (the Thracians that the Greeks called the barbarians) of the Alexander's army. 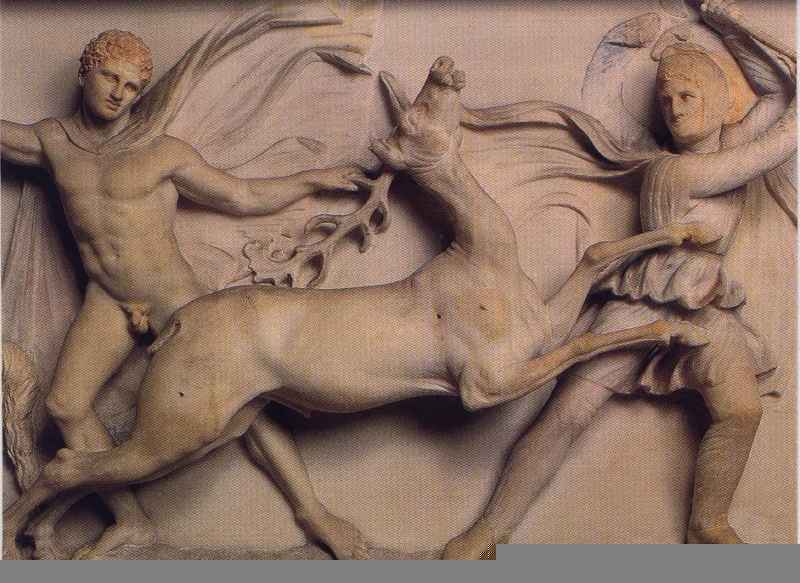 The opposite long face is decorated with two hunting scenes, those of a lion and a deer, where both the Scythians and Greeks participate. One of its short sides bear a battle scene of three isolated fights. The other short side shows a panther hunt. 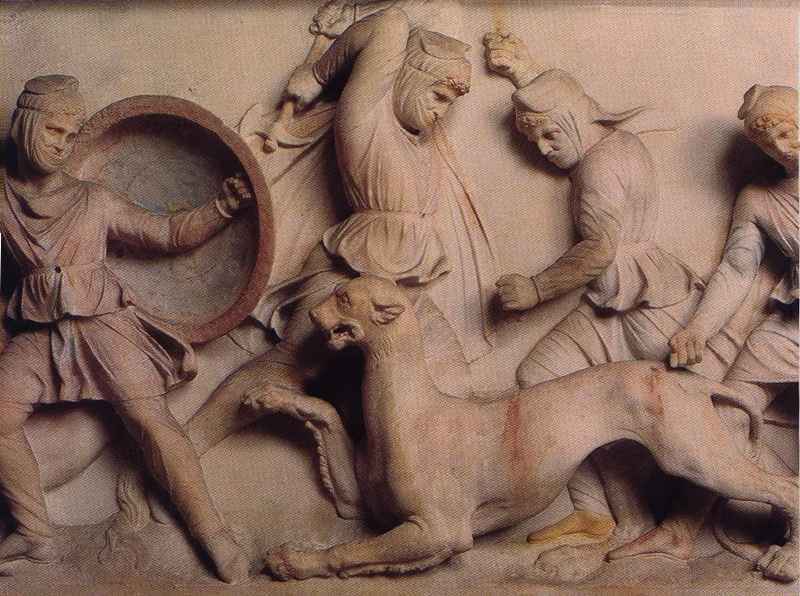 It is notable that for the sculptor, no Persian soldiers exist, and to show a Persian warrior, the sculptor has only Scythian warriors for a model. 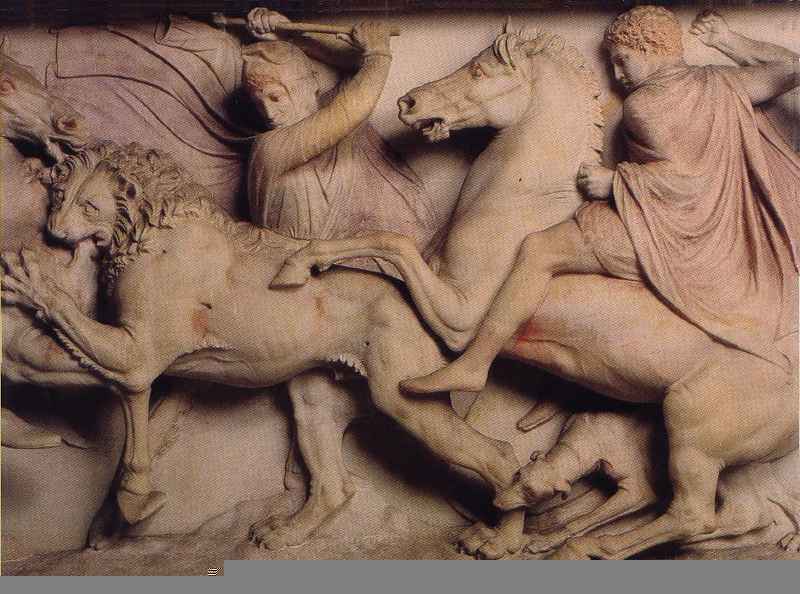 Reportedly, this is one of two sarcophaguses contracted by Alexander Macedonian himself. 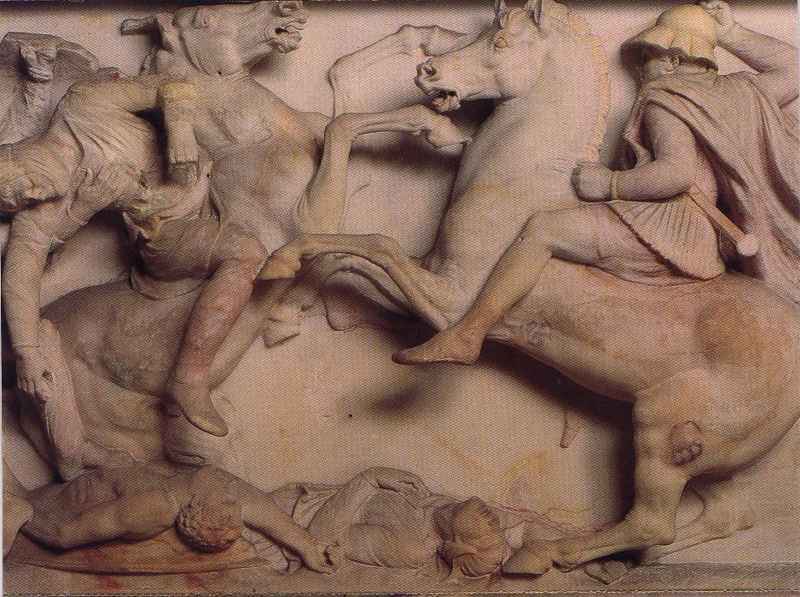 The silver swords, composite bows and arrows were stolen eons ago, so only the traces of metal embedded into the marble indicate the weapons used by the participants of the reliefs. Det 1. 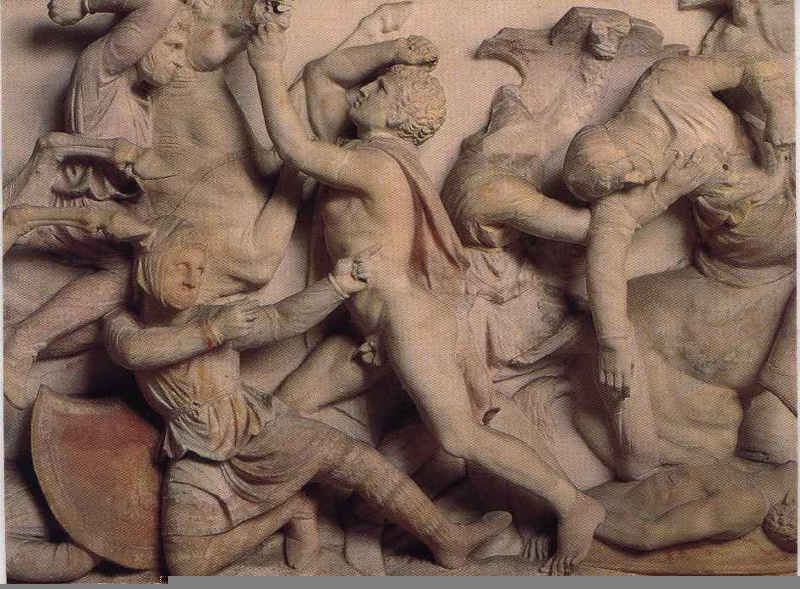 Detail from the Alexander Sarcophagus. Alexander the Great mounted on a horse and chasing a Persian Scyth soldier. 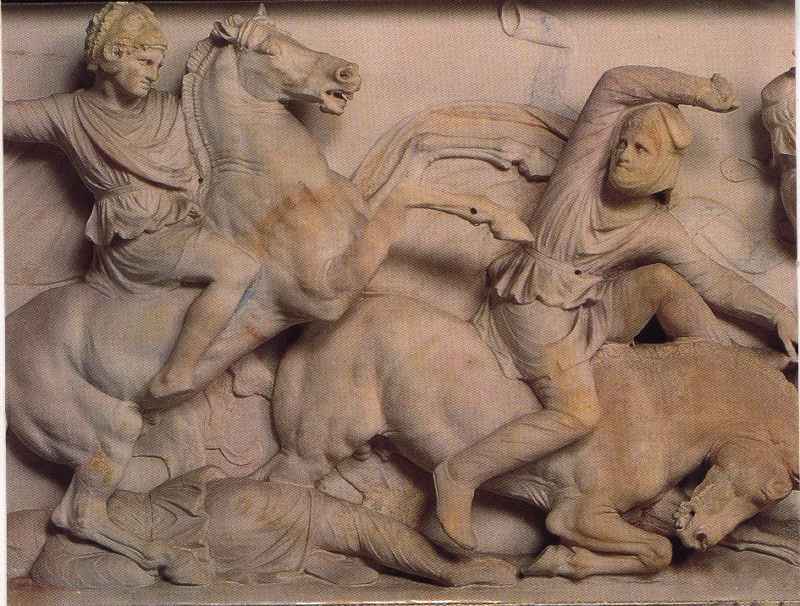 Note the pointed hat and the boots of the Scythian and the bare hill of helmeted Alexander. Scyth dressed in a pointed head-dress, with a barefoot Greek general. Scyth dressed in a pointed head-dress and boots, with a savage-dressed barefoot Greek added for a better contrast.